Ian McKellen is to celebrate his 80th birthday this year by raising funds for theatres, with a new solo show which will play on 80 stages across the UK, including Theatre Royal Brighton. His intimate show is a mixture of anecdote and acting, including Tolkien, Shakespeare, others. "Growing up in Lancashire, I was grateful to those companies who toured beyond London and I've always enjoyed repaying that debt by touring up and down the country myself, with the National Theatre, Royal Shakespeare Company, Prospect Theatre, the Actors' Company, as well as with commercial productions. Sean Mathias, the director and I have worked together for stage and screen, many happy times. "I was first onstage at Theatre Royal Brighton as Shakespeare's Richard II, one of the parts I shall reprise in my new solo show of anecdote and acting. "I"ve always relished playing in Brighton and I'm delighted that the profits from my performances this time will benefit the very necessary renovations of this beautiful old theatre"
As well as his achievements on both stage and screen, he has been an innovator on the Internet, with one of the earliest official sites for an actor, www.mcKellen.com, launched on 1 September 1997. In 1999 he began publishing a series of journal entries that evolved into one of the earliest non-technical blogs. He was co-founder of Stonewall UK, which lobbies for legal and social equality for gay people. "The UK's regional venues are integral in supporting and developing artists and practitioners across all areas of the theatre, both on and off stage. "All of us in this industry are united by a passion for the arts and love of what we do and this special show is a rare and excellent opportunity to celebrate what's best in our industry while at the same time celebrating one of its greatest actors and raising vital funds to keep the lifeblood of theatre in this country flowing." 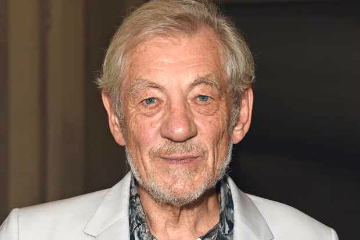 Ian McKellen at Theatre Royal Brighton from Monday 15th – Friday 19th July 2019. CLICK HERE for tickets.